One of the greatest moments in the life of an anime fan is finding one of THE shows you just know you’re going to love for the rest of your life. A show that takes tropes and elements from other anime and actually incorporates them in meaningful ways, a show that makes you feel excited about the possibilities of anime again because god it’s been so long since a show kept you personally invested from start to finish. A show that feels like it was made for you because it ticks all the boxes and contains everything you enjoy about anime without the trashier elements that so often make series with potential such a slog to get through. The first season of Mobile Suit Gundam: Iron-Blooded Orphans is this show. Rejuvenating and engaging from episode one, it has cemented itself as one of my all-time favourite anime titles and has stayed in my thoughts long after the first season’s finale. Hi, my name is Calo, and welcome to my article where I gush over how much I love Iron-Blooded Orphans Complete Season 1. You’ve been warned. 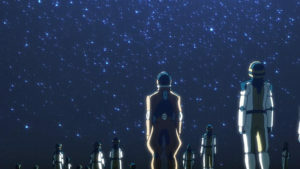 Nicknamed human debris, Orga Itsuka, Mikazuki Augus and many other children living on Mars work as child soldiers for a private security company to escape extreme poverty. Their lives change irreversibly when Kudelia Aina Bernstein, a young aristocrat seeking to liberate Mars from Earth’s rule, comes to their base causing outside forces to attack in an attempt capture her. Although their commanders leave them to die to save their own skins, the kids hold their ground and fight back, with the tide of battle turning when Mikazuki pilots the Calamity War-era Gundam Barbatos. Disgusted by the actions of the higher ups and seeking vengeance for their fallen comrades, Orga and the others seize this chance to stage a coup and take over the base. This is the birth of Tekkadan, a company known as the iron flower that never wilts, and how its crew its learn to navigate the world of business and politics as they fight to complete their first job – escorting Kudelia to Earth so she can liberate Mars. 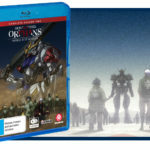 Iron-Blooded Orphans is the fourteenth instalment in the long-running Gundam franchise (although it requires no previous Gundam knowledge to be enjoyed), and my first delve into the world of Gundam. My venture into mecha anime has generally been average and not particularly memorable, so I approached Iron-Blooded Orphans with expectations of competence, and not much else. I was instead pleasantly surprised to find a gorgeous looking show that manages to balance entertainment, drama, politics, and sick robot fights in 25 episodes of quality anime. 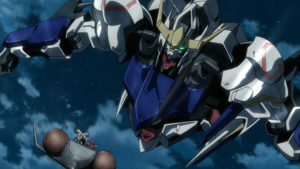 If I was to compare the show to other mecha and ‘kids in space’ anime I’ve watched – particularly Eureka Seven Ao, Classroom Crisis and Robotics;Notes – Iron-Blooded Orphans not only does the best with its concept, it handles all its elements with equal amounts grace and skill. It is probably the first anime I have watched where the politics of the world felt tangible and meaningful rather than unnecessarily tacked on flavour that does more harm than good to the narrative’s world building. Perhaps this is because the politics of the world – Kudelia’s fight for the independence of their home planet Mars and the various agendas others attempt to force upon her – are complimentary to the struggles of the Tekaddan crew. Many of those on Mars suffer extreme poverty, a poverty that forces children to become human debris by undergoing the risky implant of the Alaya-Vijnana System into their spines, so they can operate mobile combat suits without needing to be formally educated. 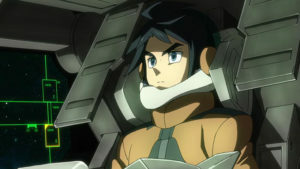 Mikazuki and Orga have the implants, with Mikazuki using his three as a way of piloting Gundam Barbatos by feel, although the data feedback can be detrimental to his health. The experiences of the Tekaddan crew personalise Kudelia’s goals – their struggles for a better life after being exploited as child soldiers is compelling and frames the politics of Iron-Blooded Orphans in a meaningful way. Iron-Blooded Orphans feels like a universe with its own internal logic and history thanks to worldbuilding using mentions of the Calamity War and the state of the Outer Spheres. This balance is often impossible to strike – it’s either too much exposition that ends up unnecessarily weighing down the story, or it’s far too little and the world feels cheap and meaningless. 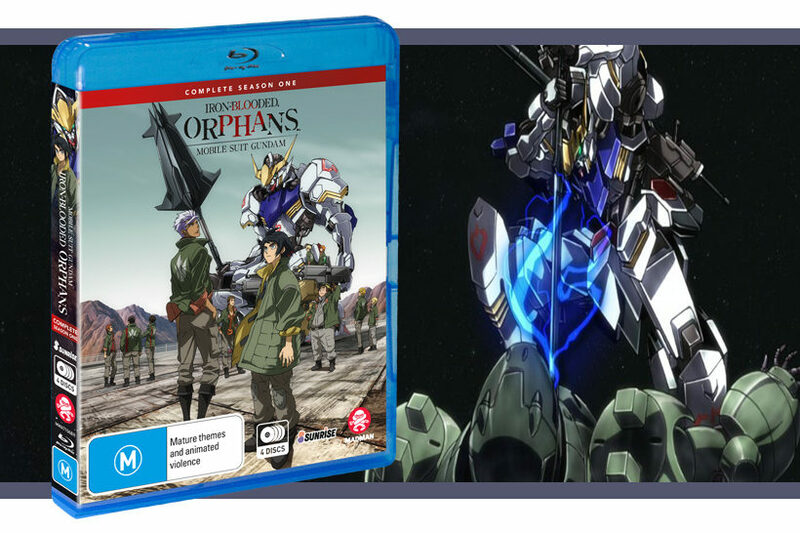 Iron-Blooded Orphans reaches a good balance, exploring the peril of Mars and the poverty of people living in the Outer Sphere with the military faction Gjallarhorn forcibly maintaining the peace. This worldbuilding is assisted by changes in perspectives of different characters throughout the episodes, as we’re able to see the desires and motivations of not just the crew of Tekkadan but members of Gjallarhorn. 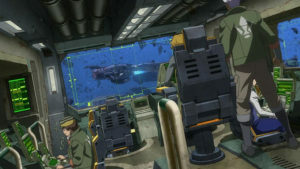 Iron-Blooded Orphans is also good at balancing the mundane with the spectacular, balancing scenes where Mikazuki destroys other mobile suits with ease alongside sections where Kudelia teaches him and the other Tekkadan members how to read, or by delivering food to crew members with the group’s cook, Atra. It’s a spectacular balance, one that serves the show well in its slower paced episodes. Child soldiers, their exploitation, and deaths plays a large role in the narrative. I’m honestly not sure how subversive the acknowledgement of how inhumane it is to have children piloting death robots and undergoing risky surgeries to be of some use to security organisations is, as I haven’t had a ton of experience with mecha anime. 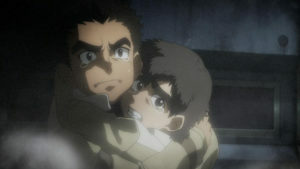 But even if this subversion is nothing new within this genre, it definitely feels special – the narrative expertly frames the perspective of the Tekkadan crew as both reasonable due to their experiences and upbringings as impoverished human debris, and as shocking when the adults around them witness their ruthlessness. This framing skews the morality within the show, creating interesting stakes and a certain brand of misery that accompanies stories about vulnerable children willing to do whatever it takes to survive. To the credit of Iron-Blooded Orphans, the show never feels solely like an exercise in misery. Rather, the struggles and losses have impact that spurs the story forward as Tekkadan and its crew try to keep moving forward. This is the first time in a while that I’ve fallen hard and fast for an entire cast of characters. 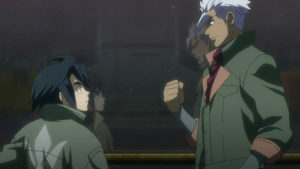 Thanks to some good pacing and a variety of character designs and motivations, each character in Iron-Blooded Orphans feels memorable and interesting. Orga and Mikazuki in particular have this great relationship that seems supportive on the surface but feels like there is something more volatile underneath as the series progresses. Kudelia’s evolving relationship with those around her is also great, and she grows into a very different person as the series progresses. So often the characters depicted as privileged do-gooders in these shows are so easy to dislike and difficult to forgive, but Iron-Blooded Orphans gives Kudelia some great character growth both early on and throughout the series that saves her from this treatment. 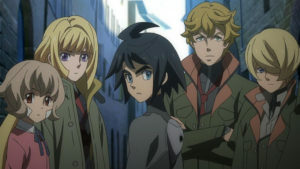 Some of the other great characters in the series are Biscuit, Orga’s confidant and the logical centre of Tekkadan, Akihiro, the talented pilot who struggles with exactly what it means to be human debris, and Atra, Tekkadan’s cook who is a lot tougher than her stature suggests. And these are just a handful of the great characters Iron-Blooded Orphans has to offer. Iron-Blooded Orphans has fantastic animation, particularly the way scenes and characters are lit. I clearly remember watching the first episode and thinking that the budget must have been particularly high for that episode and expected the quality to take a nosedive some point in the near future. I was wrong, the quality remained completely impressive, from the mobile suit battles to character animation and backgrounds. 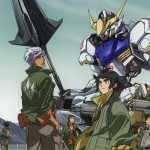 High sound quality and effects also added to the impressiveness of the mobile suit battles and overall series, with a soundtrack that feels distinct and recognisable and ups the excitement whenever it is in use. The two opening sequences also warrant a mention, as their fantastic visuals and lyrics make them nigh un-skippable. Iron-Blooded Orphans Complete Season 1 is the whole package. It is visceral and thoughtful, political and personal. Each fight in a mobile suit means something thanks to a tight and interwoven narrative but it’s also just a sheer joy to watch due to the amazing visuals and exciting soundtrack. The show is engaging from episode one, with characters and narrative twists that will stay with you long after the credits role. It’s become one of my favourite anime titles of all time, and I sincerely hope that it gives others the same sheer amount of joy it has given me.